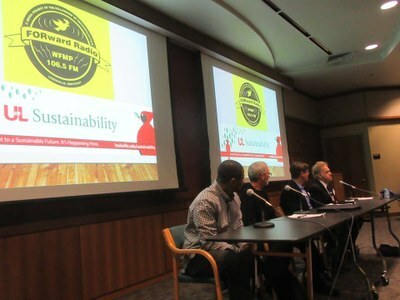 On Monday, April 9th, from 6-8pm, in the University of Louisville's Ekstrom Library Chao Auditorium, UofL's Sustainability Council partnered with Louisville's grassroots community radio station, Forward Radio 106.5fm, to mark the station's first anniversary on-air by hosting and live-broadcasting a moderated public forum for all registered candidates for Louisville's next Mayor. The theme of the evening was: Equal Opportunity & Justice: Racial & Economic Equality and Environmental & Food Justice. This was not a typical candidate debate with antagonistic posturing designed to generate 30-second sound bites. Rather, we hosted a different kind of candidate forum, one expressly designed to stimulate, inform and uplift, rather than exhaust, confound and deflate. All registered candidates for Louisville Mayor were invited to attend. Those who chose to participate were: Dave Biggers (Democrat), Bob DeVore (Republican), Ryan Fenwick (Democrat), and Jackie Green (Independent). Our impartial moderator was Judge Jerry Bowles.